Have you heard about the online website called Shoppiyo? I have never tried shopping at Shoppiyo before this instance. 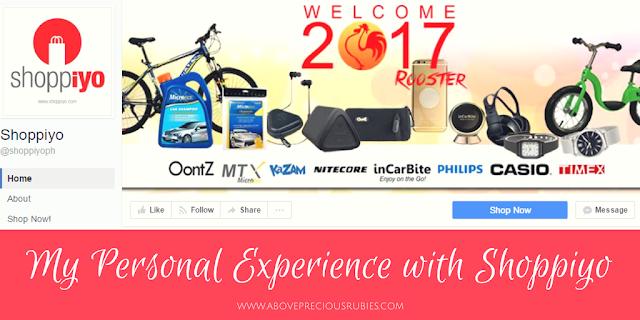 In fact, I still haven’t experienced making any purchases at their website but because they were a Lazada supplier, I was able to experience their service. This all started when my USB headset for work retired. I had to find a replacement headset that I could use. 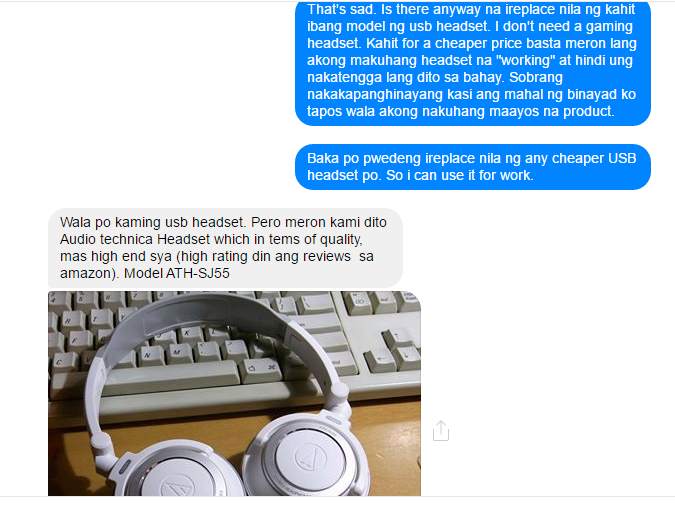 I asked for a recommendation from my workmate on what’s a good brand to buy as my USB headset didn’t have a noise canceling feature (only noise reduction). So she recommended the headset that she’s been using for years. This is what happened. 1. 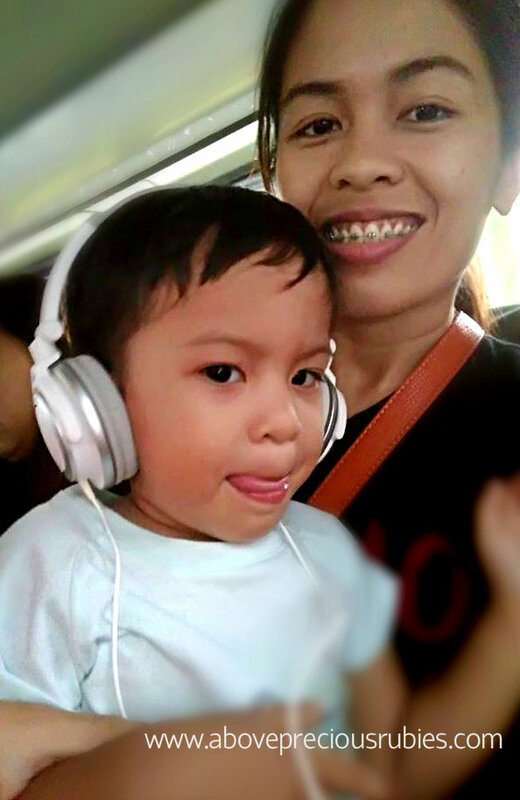 She recommended Philips SHG7980 USB gaming headset since this is a tested and proven product for her. 2. I bought one at a discounted price of 1, 999 via Lazada.com.ph. Got the product quickly (before the busy Monday at work started). 3. This headset has a detachable mic. I need to say this because this mic was the main contributor to the problem. 4. Knowing that the mic was detachable, I took it off every after shift and carefully put the headset back on its packaging (because this was the most expensive headset I’ve had so far!). 5. After a few days of using the headset, my customers complained that they couldn’t hear me. Too bad I didn’t have a backup headset so I had to use my laptop’s mic and speaker. 6. The initial plan was to contact Lazada for a possible replacement/refund, unfortunately, the 100% buyer protection has already ended so I had to contact Shoppiyo directly. This is where they get in the picture. 7. 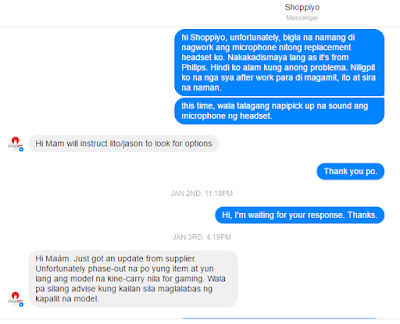 Before making the purchase at Lazada, I already searched for Shoppiyo and found out that they had a Facebook page, so that’s where I contacted them via chat. 8. I got a response shortly after and was advised to return the headset directly to them so they can have it checked for a possible replacement. 9. I sent the headset back via LBC since that’s the nearest courier from our place and paid the shipping fee. The headset itself isn’t that good, appearance-wise, but my workmate already set my expectation on that. I was ok with it as long and as the microphone and speaker are working perfectly fine, I don’t have a problem. How it looks doesn’t really matter, performance is more important for us. And since she said she never had any problems with it (she’s used it for more than 2 years already, I believe), I was confident I wouldn’t have any issues with my headset as well. Too bad, it wasn’t the case. 10. 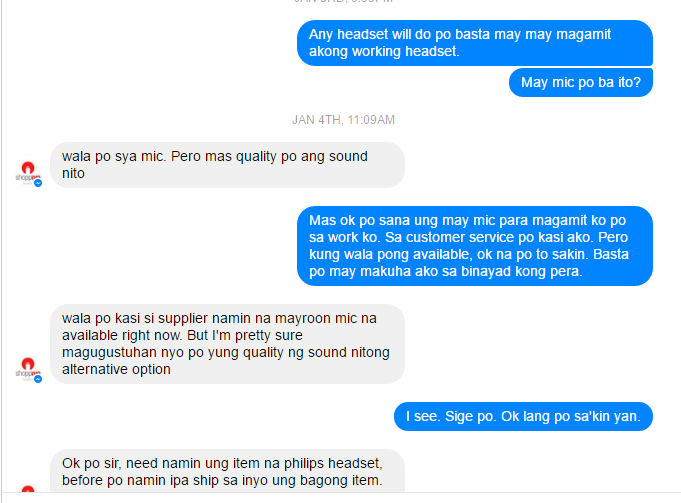 I sent the headset out Nov 25th and Shoppiyo confirmed that they received it when I asked them 3 days after. By this time, I already bought another headset in SM San Mateo that I could use for work. 11. December 7th, Shoppiyo contacted me for my shipping details so they can send a replacement for me (yay!). 12. I got the replacement right away but didn’t use it ’til December 22nd out of fear that it might be destroyed again. Since at that time I had 2 USB headsets already (one costs 1,500 and one costs almost 2,000), I was planning to sell the Philips headset. But then I thought maybe I can just keep the other one as a backup. So that’s what I did. 13. I used the replacement headset on Dec. 22nd and kept in/detached the mic still after the end of my shift, and to my surprise, the next day (Dane’s birthday), the microphone was NOT working! 14. 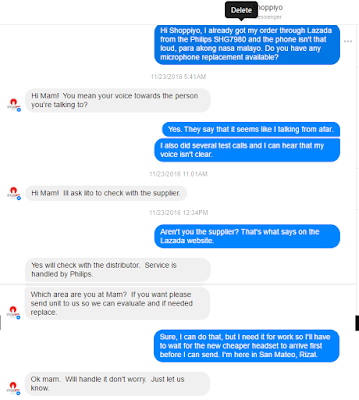 Frustrated, unhappy and upset, I contacted Shoppiyo again. I will let the screenshot do the talking this time. 15. 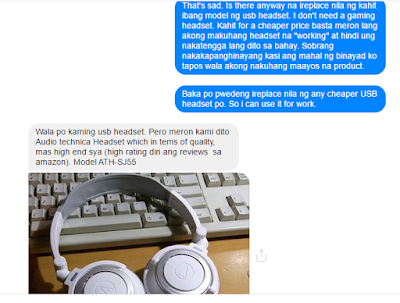 Before I agreed, I checked for the Audio Technica replacement online for the price and it was also for 1, 999 pesos. At this time, I just want something out of the PHP 2,000 that I paid for. I didn’t care if I couldn’t use it for work anymore or what not, I just wanted something that’s working in exchange of the price that I paid. 16. I sent the replacement package again, paid for shipping and waited for an update from them about the 2nd replacement. 17. I sent the package out January 5th and I got another update January 11th. This time, I was asked if I could meet them up instead for my replacement. I said yes. 18. Long story short, we met on January 16th and I got my replacement headset as promised. I think if I just didn’t touch the headset’s microphone at all, this would possibly not have happened. Actually, I was too careless to take the mic off both the original and replacement Philips headset because it said it was “detachable”. Baka hindi lahat ng detachable ay pwedeng idetach? lol. I don’t know. Sa sobrang takot kong baka masira sya, ako pa yata tuloy ang nakasira sa kanya. 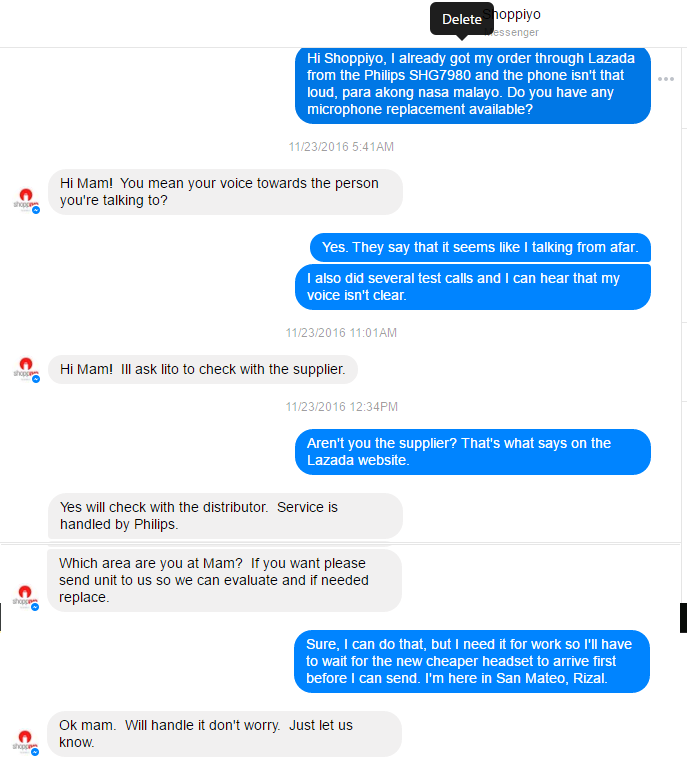 I thought they would give me a hard time the second time I contacted them about the headset not working again. The Shoppiyo rep was nice, I think they went above and beyond to make me satisfied. And even though I didn’t get the headset I was meaning to buy, I still got something for the price I paid for. Was I happy with the replacement? I can’t say I’m mad. However, I can say that I didn’t like the hassle, the extra shipping fees I had to pay, the time it took for all this to end – all those. I can still say that I’m satisfied with the outcome. You know why? I like the headset (I’m not the techie but I will try to post a review about it). It’s white, the sound quality is great, as promised and I decided to keep it and give it to Dane by the time he gets home so he won’t need to buy a headset in KSA anymore. He asked me to keep it, I think he liked it too. With that, I can say, I’m satisfied with their service. I think what’s good about Shoppiyo is they try their best to satisfy their customer. 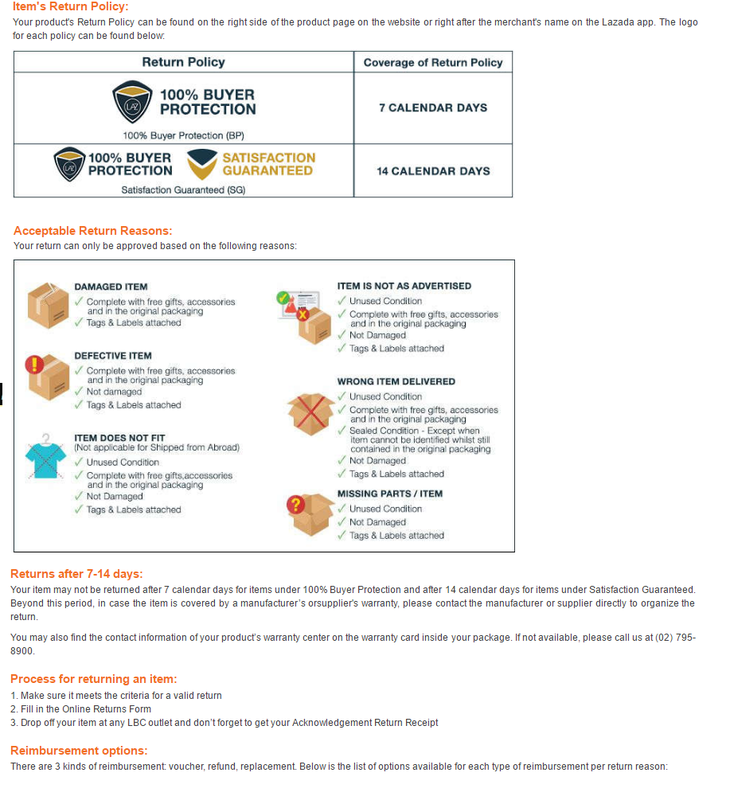 No wonder why they’re one of the top-rated suppliers in Lazada as well with 4.8 out of 5 rate. I would say yes. I’ve seen one of their personnel. He was polite and the person I spoke with via chat was also kind (although I had a feeling it was the same person, I think it wasn’t him I was chatting with the entire time). Not only that – they are very accommodating too. Hindi katulad ng ibang sellers na babalewalain ka nalang kapag nabayaran na sila. I seldom transact online. The most I did was buy airplane tickets and hotel accommodations before. I have tried Lazada before for some wall decals but then stopped purchasing from them when twice, they gave me the wrong item. I hope that experience will not happen again. Good thing you had a nice experience (at the end) re your shopping online. And bet ko and headset mo. Ang lakas makaslang. Hahahaaha. Good thing you were patient with them. I do online shopping too, pero I choose the ones who do free returns. Never tried Shoppiyo pa.
Ugh, I did some crazy shopping online in another online site last December, and while I was happy with a couple of purchases, I was truly disappointed with one vendor and the customer service. Yes, buti nalang at natapos din sa wakas! haha. haha! Ang ganda nga e. Bet ko pa kulay! If ever I need any other products, I'll make sure to order from them. Subok ko na sila e.
Ouch! Sorry to hear that! All's well that ends well! At least nahuman na og dili pud ka argabyado in the end. But it sure brought a lot of hassle on your end, no. I hope your headsets last a long time!